We’re continuing our overview journey and looking at different types of lighthouse styles found along different regions of the American coastlines. Last week we discussed New England, and today we’ll journey a little farther south and explore some of the lighthouses in the Middle Atlantic region. There are beautiful “traditional” lighthouses in this area and also some unique screw-pile lighthouses, designed to withstand weather and ice. Read on to learn more about the regional challenges and a memorable story about lightkeeping in the Middle Atlantic region. The section that we’ll call “Middle Atlantic” for the sake of this post runs the coastline of Maryland and Virginia. Technically, “Middle Atlantic” could include more southern states, but since the Southern lighthouse style is it’s own, we’ll talk about that next week. 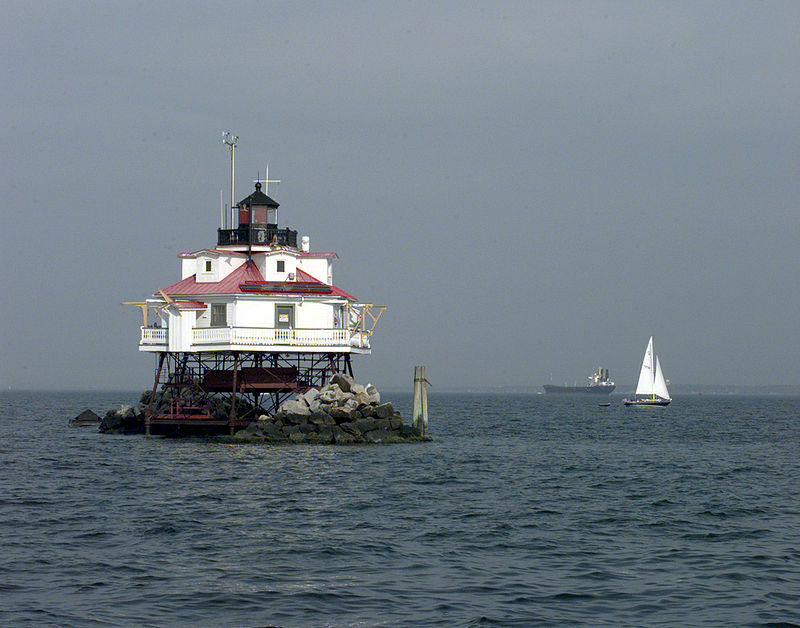 There are many lighthouses in the Chesapeake Bay and Tidewater Virginia area of the Middle Atlantic section. Semi-protected, these coastal areas have been known for their fisheries and commerce avenues to large cities. With plenty of submerged dangers and navigational challenges, lighthouses became important guides and warnings and an integral part of the maritime communities. Here – like the New England region – lighthouses were constructed as needed in the coastline and the design of those aid to navigation structures reflected the shore. For example, if the shore was flat and sandy, the lighthouse was constructed with a taller tower to make it more visible to the mariners. If an aid to navigation was needed actually out in the water and a lightship or buoy wasn’t the best option, technologies were developed for this type of construction. (See next section). A relatively common and unique style of lighthouse found in the Middle Atlantic is the pile lighthouse. These types of lighthouses are constructed on top of heavy, sturdy pylons and sit above the water. Particularly in the Chesapeake Bay, this style was important since it could withstand the moving and shifting ice on the water in winter. And then, if a lighthouse was needed on a “basic” shoreline, the construction was simpler and the design more like those in New England, but often a little more compact and maybe with a taller tower. 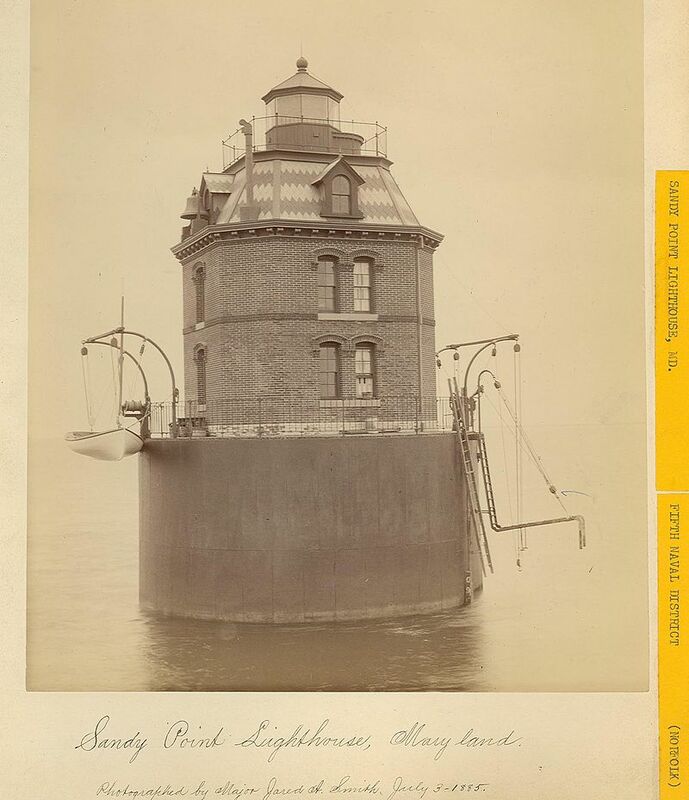 Sandy Point Shoal Lighthouse – it’s current structure was built in the 1880’s, and this lighthouse is a good visual example of a caisson style lighthouse. Still lit and maintained by the U.S. Coast Guard, this lighthouse is now privately owned and on the list of National Register of Historic Places, but doesn’t appear to be open for visits. Learn more here. Love Point Lighthouse in the Chesapeake Bay off the Kent Island, Maryland, was constructed in screw-pile style in 1872 and has stood ever since. Several earlier lighthouses at the location were destroyed by ice. 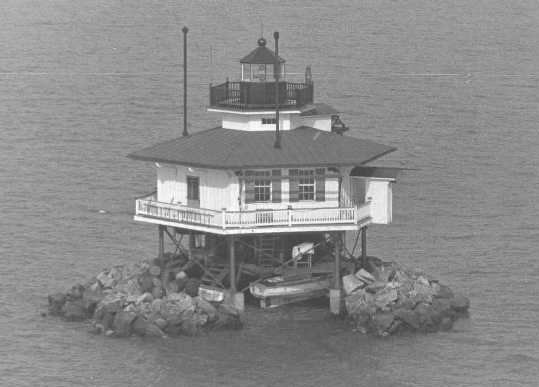 The screw-pile lighthouse was been damaged by ice, but repaired and stood until 1964 when the lighthouse structure was removed and replaced by a small, automated light on the original foundation and platform. 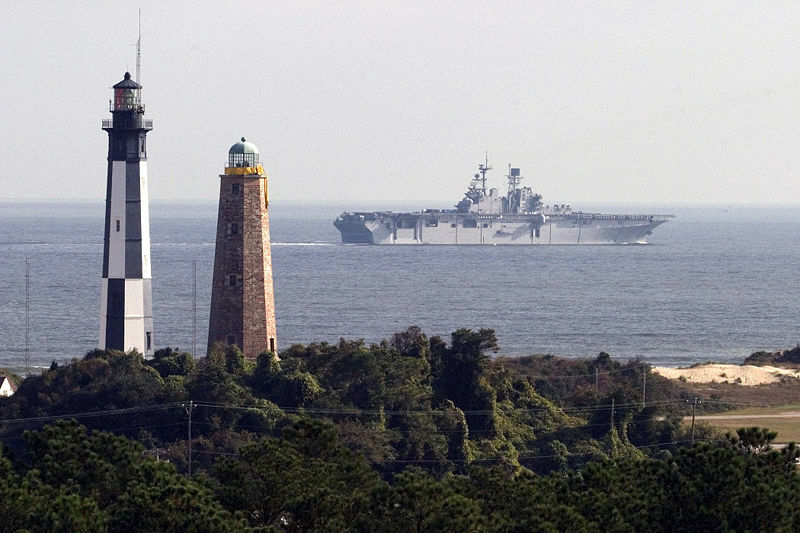 The Cape Henry Lighthouses – standing in modern Virginia City Beach – have a unique story. The first was authorized in 1792 and constructed on shore at the entrance to the Chesapeake Bay at a major point for maritime traffic. During the Civil War, the tower was damaged, but repaired after the conflict. However, by 1881, a second lighthouse had been constructed because there was concern about the stability of the original structure. Happily, both lighthouses are still standing and both are National Historic Landmarks and can be toured. Cape Henry Lighthouses, original tower to the right; 1880’s tower to the left! 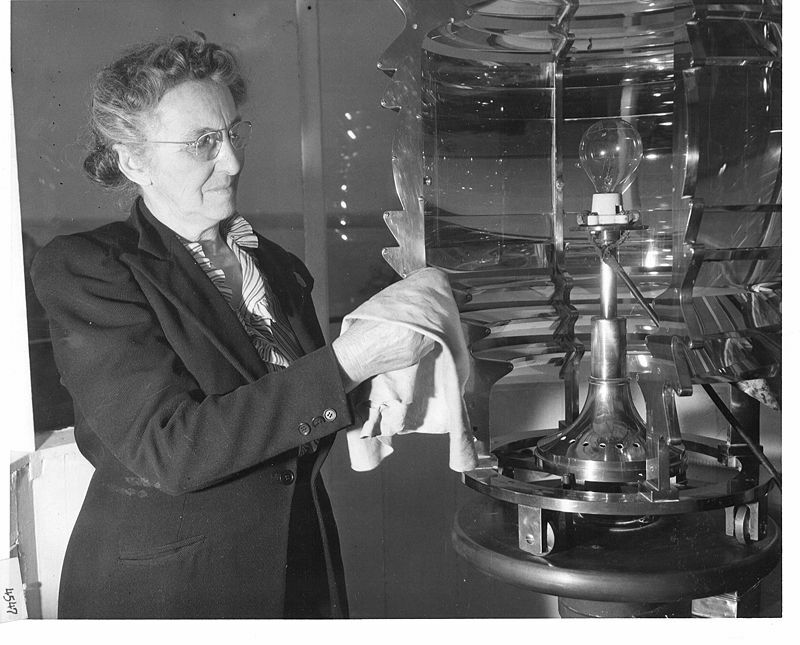 Fannie Salter was the last civilian woman to official keep a lighthouse. She spent forty-five years tending to aids to navigations and twenty-two of those years – following her husband’s death – she served alone at Turkey Point Lighthouse in Maryland. Before the station was electrified, Fannie would fill and light one of the two lamps at dusk, climb the tower and place the lamp within the lens, then recheck it about one hour later, and again at 10 pm before going to bed. From her bedroom in the keeper’s quarters she could see if the light was functioning properly and would immediately awake if the light ever went out. With electricity installed in 1943, she only had to turn on a switch, which lit a 100 watt bulb, which in combination with the lens produced 680 candlepower of light. Once she had to manually strike the fog bell when it suddenly failed as a steamer was heading for the Chesapeake and Delaware Canal in a fog. She rang the bell four times a minute for 55 minutes until the steamer had safely passed. In so doing, she was away from the phone when her son-in-law tried to call and tell her that her daughter had given birth to her granddaughter.